Last week Doug George-Kanentiio sent me notice about the recent establishment of the Hiawatha Institute for Indigenous Knowledge in New York State, in partnership with Syracuse University. The Institute has just been gifted a historically and spiritually vivid parcel of land for its headquarters. Thus has come about an opportunity for profoundly important old roots to settle back into the land, and to send out new branches. Doug and his wife Joanne Shenandoah -- both serving on the board for The Hiawatha Institute -- have with others long held the vision for such an institution, something that may develop to become an Indigenous University anchored on North America, open to students from all cultures and all parts of the world. “Our way is to make it possible that people come to a meeting of the good mind," Doug told me two years ago. "To get there, you need to sit in respect with one another. You have to invite people from all walks of life and viewpoints to share information, and you have to listen to one another." 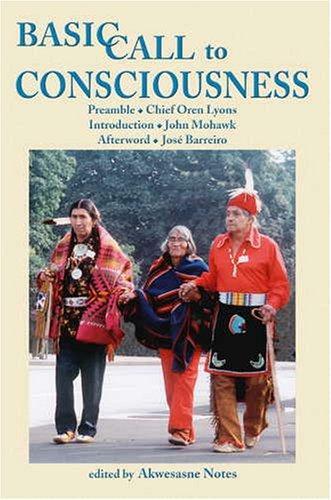 In learning about the establishment of the Hiawatha Institute and its mission, I was reminded of a seminal tract of reading that arose from the same native North American wisdom streams some 34 years ago this month: Basic Call to Consciousness. That's the title of a succinct book that conveys core expressions of the oldest, deepest traditions of North America, and places them with resonant validity in the context of our raucous era. Basic Call to Consciousness -- The Haudenosaunee Address to the Western World -- was initially articulated to an array of NGOs at the United Nations in Geneva, Switzerland, October 1977, and then later published in book form by Akwesasne Notes. The work is a classic of informed and elevated political and spiritual philosophy that is acutely relevant now, and that will likely remain relevant for centuries on into the future. The Hiawatha Institute will help make that possible, striving to listen consciously to the call of the land and then to respond from the good mind. "For centuries we have known that each individual's action creates conditions and situations that affect the world. For centuries we have been careful to avoid any action unless it carried a long-range prospect of promoting harmony and peace in the world. In that context, with our brothers and sisters of the Western Hemisphere, we have journeyed here (UN) to discuss these important matters with the other members of the Family of Man." "...The principles of righteousness demand that all thoughts of prejudice, privilege or superiority be swept away and that recognition be given to the reality that Creation is intended for the benefit of all equally -- even the birds and the animals, the trees and insects, as well as the human beings..."
"...The people who are living on this planet need to break with the narrow concept of human liberation, and begin to see liberation as something which needs to be extended to the whole of the Natural World. What is needed is the liberation of all the things that support Life -- the air, the waters, the trees -- all the things which support the sacred web of Life..."
You can read the text of Basic Call to Consciousness online here, or purchase a bound copy of the book through the Open Library hub. 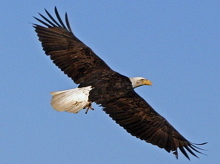 The theory of gravity says a feather should fall as fast as a stone, and in the artificial conditions of a laboratory, it can be seen to do so. But in the real world, other factors come in to play and the theory doesn't hold. It would also be nce if everyone lived by the Golden Rule, but in the real world, there are bad guys preventing us from achieving that Utopian state.....The notion that indigenous Americans lived in harmony with Nature is a false romantization. They lived in a life & death struggle with Nature, on the edge of maximum competition for resources, right at the carryiing capacity of the environment. Life was very tough. ... Western technology has pushed that carrying capacity way up so our current population and the competiton for resources is only about 2/3rds of the theoretical maximum. As we deplete the non-renewable resources, the carrying capacity will fall again and we'll be liviing on that edge again where The Law of the Jungle rules. Which way is really more humane? Hi Dave - Thanks for your comments, insightful as always. Our native relatives have traditions that can provide a helpful depth of understanding to the present, as well as to the future we are creating. Steven, I agree with so much of this post. We teach our kids while growing up to be kind to others, don't fight, don't make fun of others, and always speak positive words. Then they grow up and enlist in the military and go off to war which is against everything they've been taught. It's kind of a conflict. Don't you think? I know there are bad guys in the world and most likely they aren't going to change. All I can do is try to encourage my small realm of influence to look past the differences. Although I don't agree with everyone's lifestyle, I do respect the fact they have the freedom to exercise them. Have a great Nebraska fall Day.